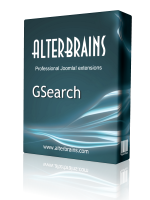 Ideal search solution for big websites. Search results look can be customized right in Joomla!. 2. Is there a CSS style sheet file r for this extension ? Btw, if we use the Google CSE, are we required to have adsense adverts on our site ? No, Google doesn't allow this, but it allow to customize colors and background. Free CSE version shows adverts, paid version - probably not. There is 'All' search mode and all indexed URLs can be displayed. Otherwise if you select i.e. 'News' menu item which has 'news' alias - all URLs started with '/news' will be searched.